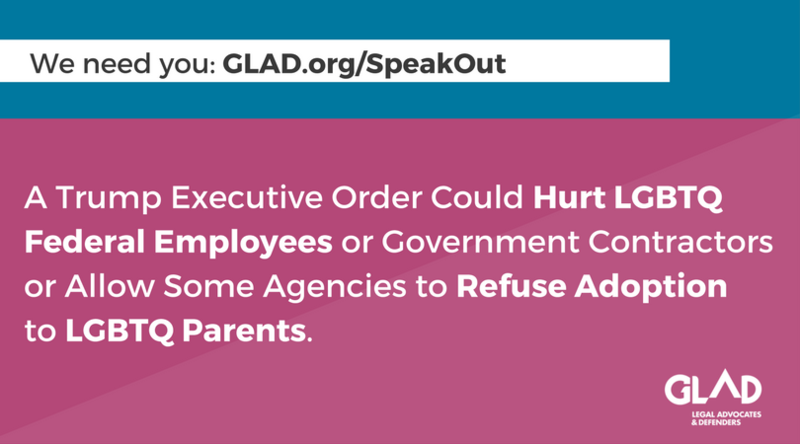 Could you be affected by an anti-LGBTQ Executive Order? If Trump targets LGBTQ people with a so-called “religious freedom” Executive Order, GLAD will fight back. But first we need your help. An employee of the federal government who could see repercussions in your workplace, like losing protections you have as an employee or being treated differently because of your LGBTQ status? An employee of an individual or entity that receives money from the federal government which may claim some kind of religious purpose? Receiving or considering adoption services from an organization with a religious mission that receives money from the federal government? Receiving or considering other social services for yourself or a family member from an organization with a religious mission that receives money from the federal government? We recently saw the first indication of how the Trump administration could target LGBTQ people, as a draft Executive Order cynically claiming to be about “religions freedom” was leaked to the press. While such an order has yet to be signed, GLAD is preparing – and we want you to be prepared, too.